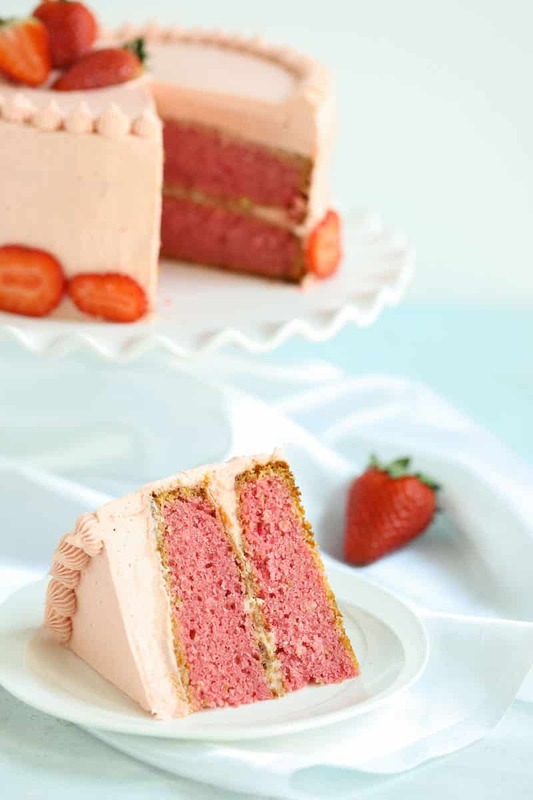 This strawberry cake is bursting with flavor and is absolutely stunning. Your family will love it! This homemade strawberry cake has the BEST fresh strawberry flavor which gets amped up by the use of Jello. 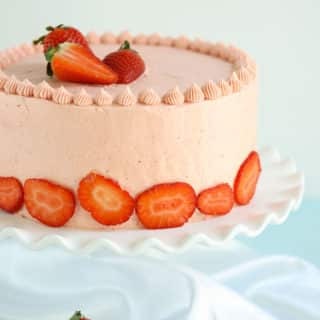 This homemade cake recipe is so easy to make, using fresh OR frozen strawberries, and will be a favorite in your home. Be sure to top it with my delicious strawberry frosting! This is a homemade strawberry cake that does NOT use a white cake mix as its base. This recipe is super, super easy so please don’t run off scared and think you can’t make this. You totally can! I just want to be upfront and let you know ASAP that, although I use Jello in my cake, this isn’t one of the cake mix + jello recipes. 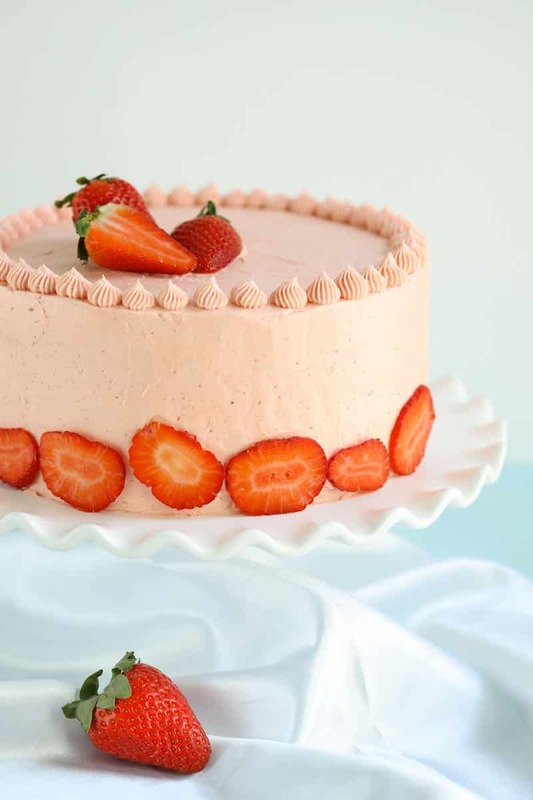 Homemade strawberry cake is about as summer as summer can get. 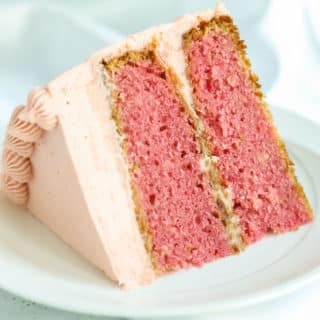 The best way to spend a summer evening, in my opinion, is sitting on the porch with a cup of coffee and strawberry cake. I’ll take a puppy on my feet, a happy teenager on the hammock, and the sounds of a busy neighborhood all around. Can you see it? Can you hear it? I cry when I look at this cake. It is simply stunning. Can I walk around with this cake in my hand everywhere I go? I guarantee the world would stop fighting and crying and start following me and begging for a wee taste. It is simply stunning. The good news is it truly tastes as good as it looks. Which, is really really good! Why do I use Jello in my strawberry cake? 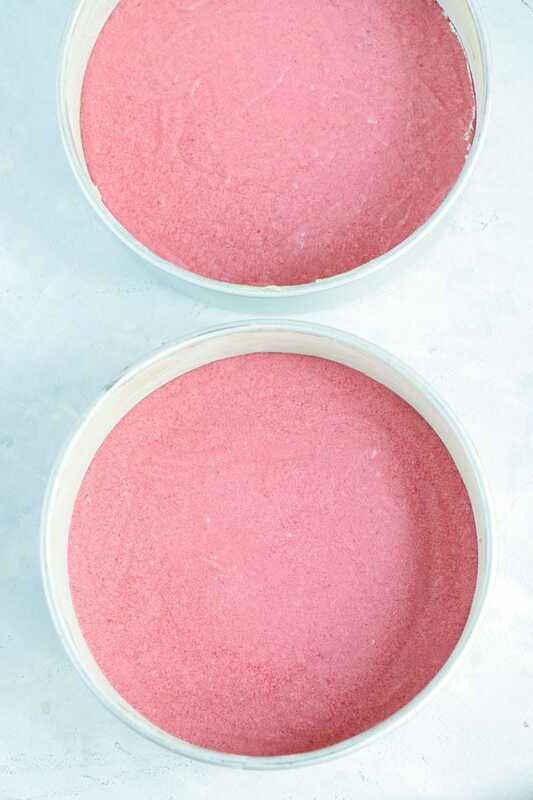 The strawberry flavor is intensified by the use of strawberry Jello mix, an easy way to get more strawberry flavor and gorgeous color without having to use pints and pints of strawberries. 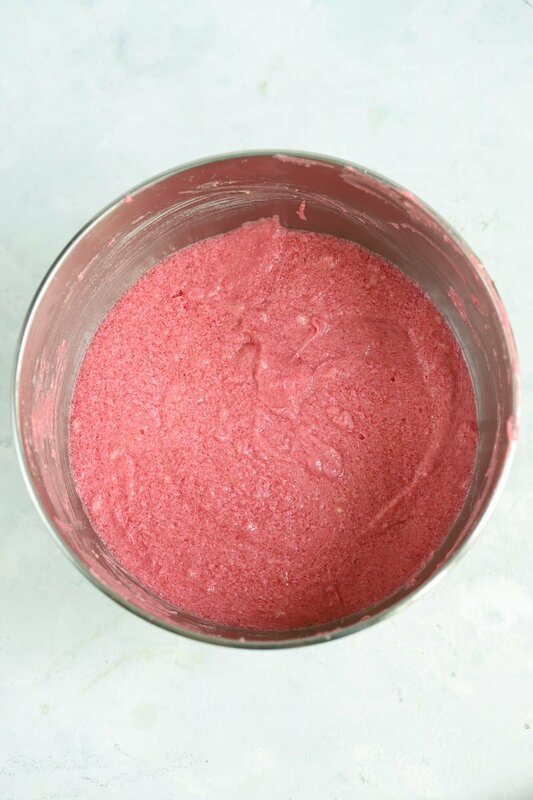 How do you make a fresh strawberry puree like what many strawberry cakes use? For this cake, I simply put the fresh strawberries in my mixer before adding anything else and turn it on high. After several minutes my strawberries are pulverized. Just put that into a small saucepan on medium high heat until it’s reduced in half. Why, though? Why bother with a strawberry puree? 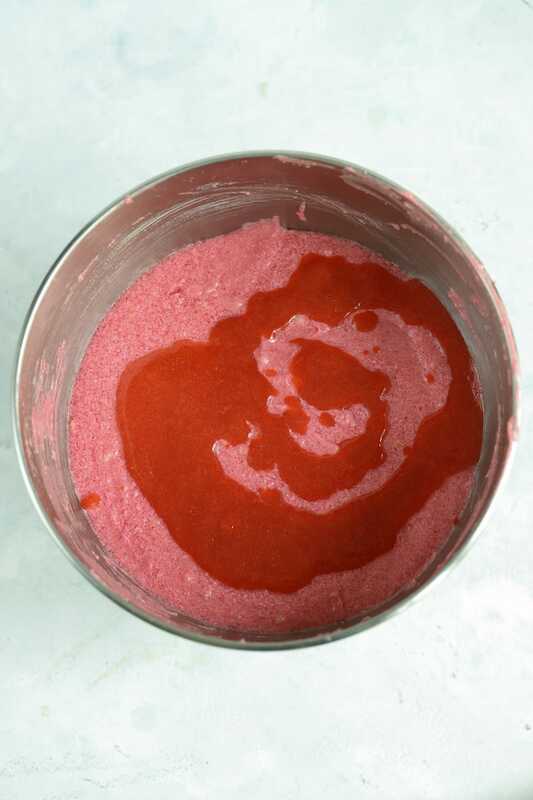 The strawberry puree intensifies the flavor dramatically. In fact, if you reduce the strawberries down even FURTHER than my recommended half you will intensify that flavor all the more. Strawberries, although delicious eaten fresh, don’t have a strong flavor. It takes a bit of effort to get that flavor to come out without resorting to extracts and such. The effort is totally worth it. I promise! And the puree will be simmering on the stove while you work on the rest of the cake. Just be sure to cool it before you put it in your cake! (throw it in the freezer for a bit to make that go fast. For a fun, easy, and delicious Patriotic dessert add blueberries to the top of the cake and whipped cream to create the traditional red, white, and blue color combo. This cake is one I make often in the summer when fresh strawberries are abundant at the local farmers market. In the winter, I simply use frozen strawberries with absolutely no sacrifice for flavor. 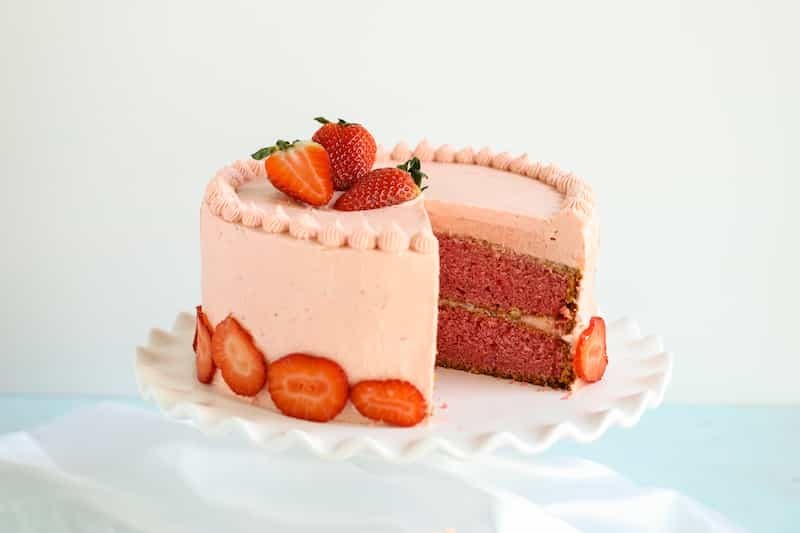 How do you make a strawberry cake with frozen strawberries? When subbing frozen fruit for fresh fruit, increase the baking time by a few minutes because the colder fruit decreases the batter temperature causing it to take a bit longer to bake. Always be sure the berries are thawed and patted dry and then treat them as if they were their fresh counterparts. After I get a batch of this cake batter mixed up I just sit and look at the beautiful color of it. That pink is so very, very lovely! You’ll be slapping hands away, at this point. Heck YOU might be the worst. This cake is so yummy. For a bonus fresh strawberry flavor, try finely chopping a few fresh strawberries to stir into your batter right before you pour it into your pan. This strawberry cake recipe is a large one. It makes a large 9 by 13 cake or a triple-layer cake. This is the perfect cake for a party, event, or family affair because of how many servings you can get out of it. Of course, the fact that it’s delightful and not overly sweet is a bonus! Can there be any better sight on your kitchen table on a Saturday afternoon? Sigh, I don’t think so. This cake deserves a pretty cake platter, don’t you think? I hope you make enough cakes that you totally have one. Or two. 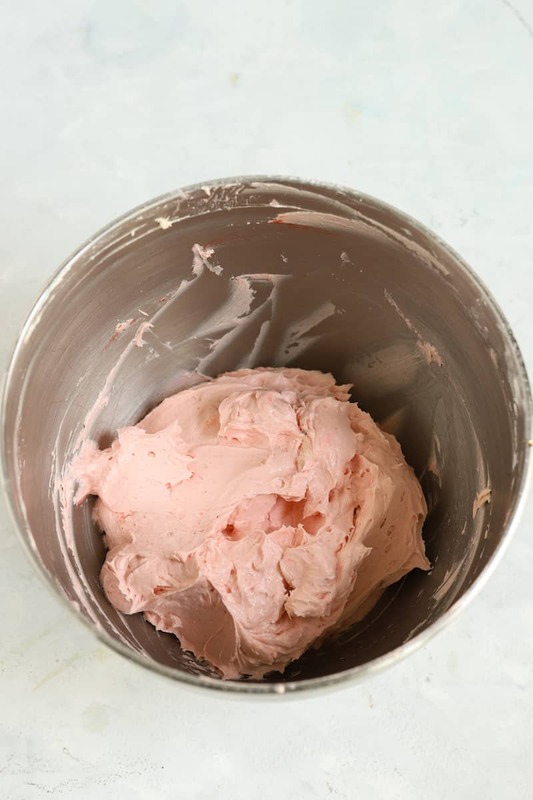 Be sure to puree enough strawberries when you start your strawberry cake to use some of them in this frosting recipe. Honestly, your life will never be the same after this combo! Add your strawberries right at the end of making your frosting. And don’t forget that wee bit of salt…it makes all the difference for flavor! This cake is decorated only with strawberries. Simple, sweet, and gorgeous! Preheat oven to 350degrees. Grease and flour 2 8inch cake rounds. Puree your strawberries, transfer to a small saucepan and boil gently until reduced by half (about 20 minutes). Cool completely. You want to end up with about 1/2 cup pureed strawberries --->TIP: double your strawberries if you want to make the strawberry frosting. You'll save yourself the step of doing those later! 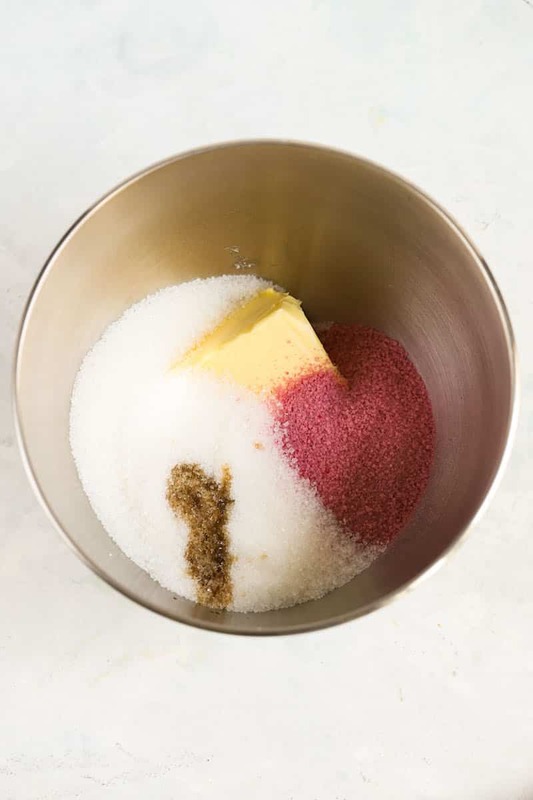 Add butter, sugar, vanilla, and jello to a large mixing bowl. Beat until smooth. Add eggs one at time beating between each egg. In a separate bowl mix flour and baking powder. Add milk and flour alternately to the butter mixture. Beat well after each addition. Bake for 35-40 minutes or until toothpick in the center comes out clean. Add salt, extract, and cream and beat again until light and fluffy. Stir in the cooled strawberry puree. I generally only add 3 cups of sugar to this frosting. It cause the frosting to be thinner and doesn't allow for spreading along the sides of a layer cake. It sounds bold to claim this is the BEST. But it really is. Siri recommends it, the comments prove it…try it and see for yourself! Shared, pinned, read, made, and loved by over 1 million people. I mean…heck! 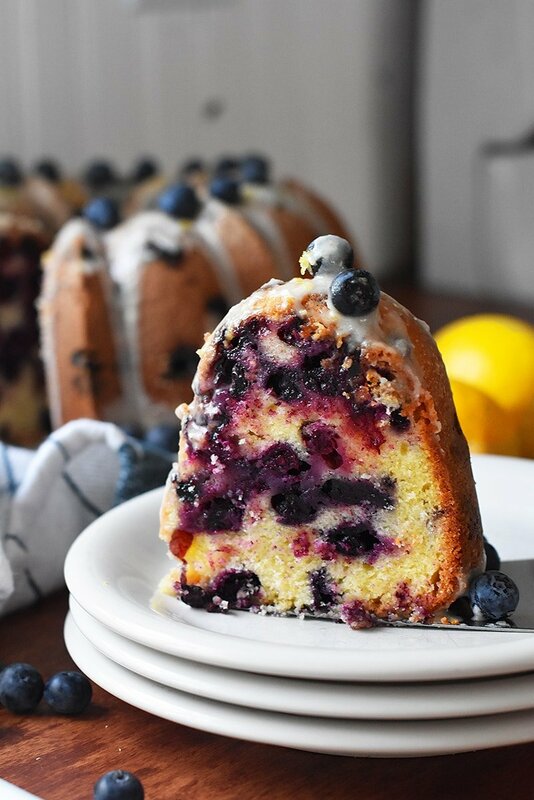 My personal favorite, this old-fashioned sour cream bundt cake is bursting with fresh blueberries and fresh lemon flavor. 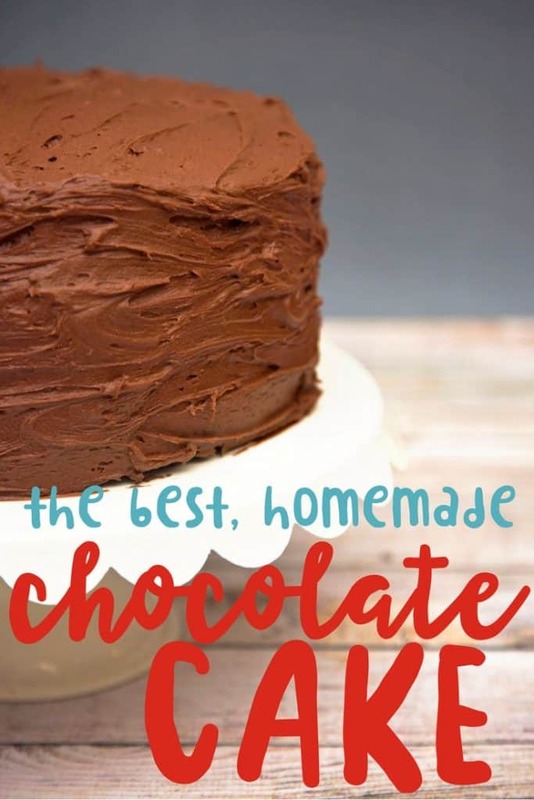 This one might top the popularity of the chocolate cake. And frankly, I am A-okay with that! White cake seems boring after the chocolate and lemon blueberry. 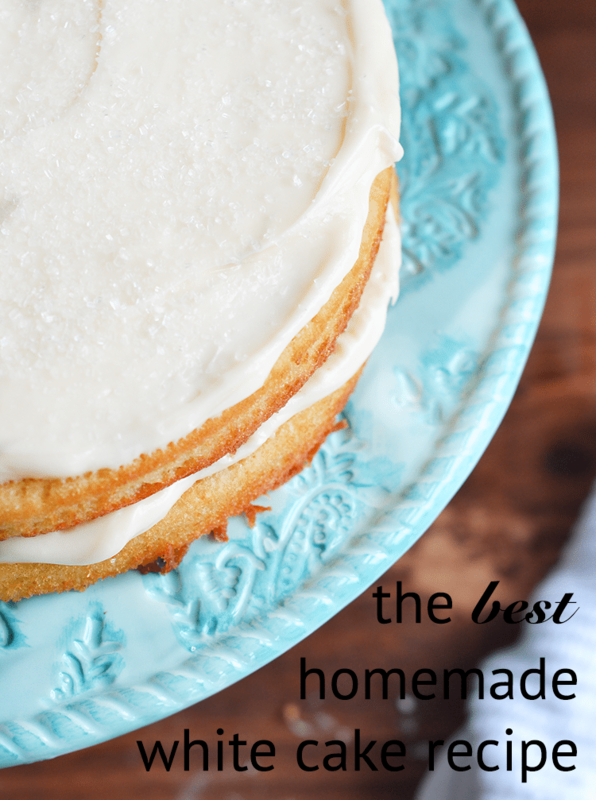 But there isn’t a cake as versatile and consistent as this white cake. You’ll use it for Birthday’s, Graduations, Summer Picnics, and everything in between. 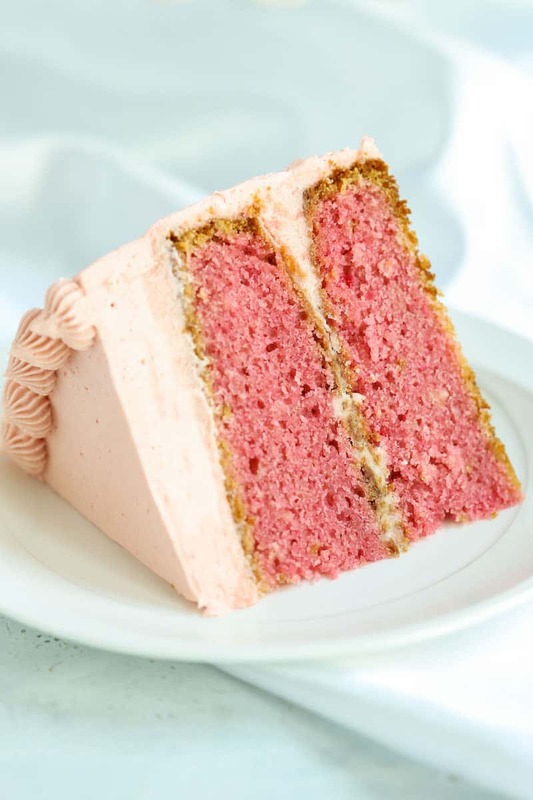 I don’t see where and when to incorporate the strawberry puree into the cake batter. Unless Im blind and missed it ;) please advise. Thanks! Oh gosh, sorry!! At the very end gently stir it into the batter just until stirred in. I tried this recipe. It’s now my go to strawberry cake recipe. Thank you for sharing. So glad to hear that!! And thanks for coming back and letting us know, we always love hearing good things ;). I am about to try making your delicious cake. How long will it last? The function is tomorrow night. Does it need to be refrigerated? The cake does not need to be refrigerated. But the frosting would do well to be in the fridge overnight and be taken out in the afternoon. Good luck!! !